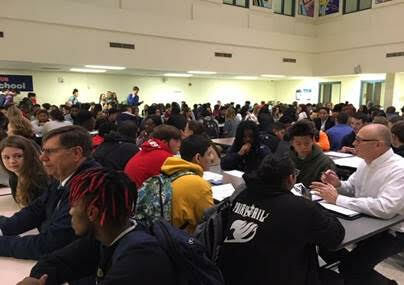 Seventy five professionals from area businesses and colleges participated in a Career and College Dating Program on November 16th. They shared information about their career experience, education paths and future opportunities with 350 students. In the Career and College Dating program, 4 -5 students meet with a professional for 10 minutes. At the end of that time, the students move to the next professional. This allows students to explore multiple career and college choices in a short time.